Floor model heater. 10KW, 240V, PH1. Includes 130 lbs of stones. Size: 19 7/8"w x 17"d x 27 1/2"h.. Pro 144..14.4 KW / 208 V / 3 Phase / 630-950 cu.ft Helo’s original "Classic" commercial heate..
Helo Viki 80D Digital Heater, 8KW, 240V, PH1 (250-425 cu. ft.), includes rocks (control and conta..
Wall mounted heater. 4500 Watts, 240V, PH1. Size: 16"w x 11"d x 24"h. Built-in controls with sile..
Helo SO-80SC Heater, 8KW, 208V, PH3 (250-425 cu. ft.), includes rocks (control not included) ..
Helo Junior 21 Heater (45 to 100 c.f. ), 120v, 17.5amp, Wire Size 12 Helo Junior is a modern, ..
4400 Watts, 240V, PH1. Stainless & Grey casing. Includes 200 lbs of stones. Forget about plan.. Floor model heater. 12.6KW, 240V, PH1. Includes 130 lbs of stones. Size: 19 7/8"w x 17"d x 27 1/2..
Helo Octa 105 Heater, 10.5KW, 240V, PH1 (390-600 cu. 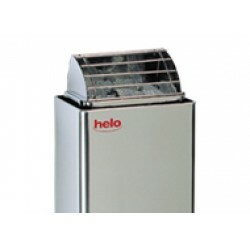 ft.), Stainless Steel, includes rocks He..
Helo Saunatonttu 4 Heat Storing Heater, 4.6KW, 240V, PH1 (175-310 cu. ft.), includes handheld con..
Wall mounted heater. 6000 Watts, 240V, PH1. Size: 16"w x 11"d x 24"h. Built-in controls with sile..
Helo SO-80D Digital Heater, 8KW, 240V, PH1 (250-425 cu. ft.), includes rocks (control not include..
Helo Junior 21 Heater (45 to 100 c.f. ), 240v, 17.5amp, Wire Size 12 Helo Junior is a modern, ..
6000 Watts, 240V, PH1. Wall mounted. Includes 50 lbs of stones. Size: 16"w x 11"d x 24"h. Uses wa.. Floor model heater. 14.8KW, 240V, PH1. Includes 130 lbs of stones. Size: 19 7/8"w x 17"d x 27 1/2..